Continuing translations of Key Concepts in Intercultural Dialogue, today I am posting KC#22: Cultural Identity, which Vivian Hsueh-Hua Chen wrote in English in 2014, and which Alina Timofte has now translated into Romanian. As always, all Key Concepts are available as free PDFs; just click on the thumbnail to download the PDF. Lists organized chronologically by publication date and number, alphabetically by concept in English, and by languages into which they have been translated, are available, as is a page of acknowledgments with the names of all authors, translators, and reviewers. Continuing translations of Key Concepts in Intercultural Dialogue, today I am posting KC#22: Cultural Identity, which Vivian Hsueh-Hua Chen wrote for publication in English in 2014, and which Alina Timofte has now translated into German. As always, all Key Concepts are available as free PDFs; just click on the thumbnail to download. Lists of Key Concepts organized chronologically by publication date and number, alphabetically by concept, and by languages into which they have been translated, are available, as is a page of acknowledgments with the names of all authors, translators, and reviewers. Continuing translations of Key Concepts in Intercultural Dialogue, today I am posting KC#22: Cultural Identity, which Vivian Hsueh-Hua Chen wrote for publication in English in 2014, and which Salma Tariq Shukri has now translated into Arabic. As always, all Key Concepts are available as free PDFs; just click on the thumbnail to download. Lists of Key Concepts organized chronologically by publication date and number, alphabetically by concept, and by languages into which they have been translated, are available, as is a page of acknowledgments with the names of all authors, translators, and reviewers. Continuing translations of Key Concepts in Intercultural Dialogue, today I am posting KC#22: Cultural Identity, which Vivian Hsueh-Hua Chen wrote for publication in English in 2014, and which Nrupa Vyas has now translated into Hindi. As always, all Key Concepts are available as free PDFs; just click on the thumbnail to download. Lists of Key Concepts organized chronologically by publication date and number, alphabetically by concept, and by languages into which they have been translated, are available, as is a page of acknowledgments with the names of all authors, translators, and reviewers. Continuing translations of Key Concepts in Intercultural Dialogue, today I am posting KC#22: Cultural Identity, which Vivian Hsueh-Hua Chen wrote for publication in English in 2014, and which John R. Baldwin and Lûiz Fêrnando da Silva have now translated into Portuguese. As always, all Key Concepts are available as free PDFs; just click on the thumbnail to download. Lists of Key Concepts organized chronologically by publication date and number, alphabetically by concept, and by languages into which they have been translated, are available, as is a page of acknowledgments with the names of all authors, translators, and reviewers. Continuing translations of Key Concepts in Intercultural Dialogue, today I am posting KC#22: Cultural identity, which Vivian Hsueh-Hua Chen wrote for publication in English in 2014, and which Yan Qiu has now translated into Simplified Chinese. As always, all Key Concepts are available as free PDFs; just click on the thumbnail to download. Lists of Key Concepts organized chronologically by publication date and number, alphabetically by concept, and by languages into which they have been translated, are available, as is a page of acknowledgments with the names of all authors, translators, and reviewers. Continuing translations of Key Concepts in Intercultural Dialogue, today I am posting KC#22: Cultural identity, which Vivian Hsueh-Hua Chen wrote for publication in English in 2014, and which Akari Takenishi has now translated into Japanese. As always, all Key Concepts are available as free PDFs; just click on the thumbnail to download. Lists of Key Concepts organized chronologically by publication date and number, alphabetically by concept, and by languages into which they have been translated, are available, as is a page of acknowledgments with the names of all authors, translators, and reviewers. I spent July, August and September 2016 teaching a graduate seminar at Royal Roads University, located in Victoria, BC, Canada, as part of their Master of Arts in International and Intercultural Communication (MAIIC) for the second time (the first time was described a year ago). The course was Contemporary Issues in Communication: Cultural Identity. The 39 students came from China, Nigeria, India, France, Senegal/France, Japan, Korea, Vietnam, Jordan, Brazil, the US, and Canada. Near the end of the course, there was a banquet for students in the program, and many photos were taken, including one with those faculty, staff and administrators who were present. We took another the last day of class. None of these includes everyone. Students worked on a major course project on the social construction of migration in the public sphere. Each one looked at a different part of the story – I hope to upload some of their results in later posts. While at RRU, I arranged for an intern for CID, Min He. She started her work as Assistant to the Director on October 3, 2016. I also was asked to supervise a doctoral dissertation in Interdisciplinary Studies, and have started working with Liton Furukawa on her project. An international student herself, she will examine the transition international students make after graduation (when Canada offers them a 3 year residency permit) to being international workers. My thanks to Juana Du, program head of the MAIIC, for again inviting me to her beautiful campus to work with an incredible group of students! 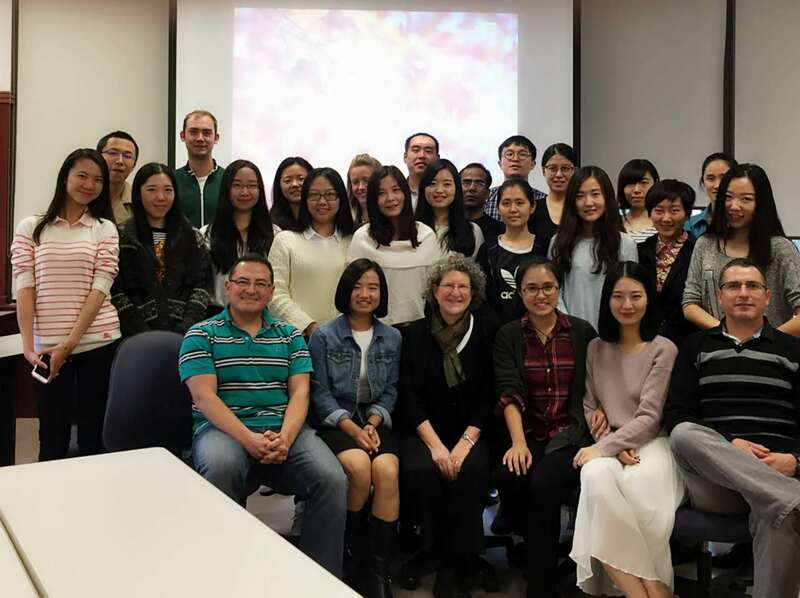 Across August, September, and October of 2015, I taught a graduate seminar at Royal Roads University, located in Victoria, BC, Canada, as part of their Master of Arts in International and Intercultural Communication (MAIIC). The course was Contemporary Issues in Communication: Cultural Identity. The 38 students enrolled were quite international, as they came from China, Ecuador, Bangladesh, Barbados, and Canada. On the last day of class, several students asked for photos, so here’s one, although not everyone was present at the time. Imagine another dozen added to the group. • Creating pre-departure orientation materials for the Office of Global Advancement to use in preparing students, staff and faculty for a trip to Ecuador. While at RRU, I was asked to participate in a public conversation, Communication Matters: Immigration from an Intercultural Communication Perspective. Dr. Juana Du, program head of the on-campus version of the MAIIC, served as host. Other participants were Lisa Selvey and Jingya (Celine) Yang, two students from the course. Follow the link to get to the video, which is now available on YouTube. One of the highlights of my time at RRU was being able to watch Tom LaFortune carve a totem pole for the campus, and then attending the unveiling ceremony. I posted last year about the beautiful campus, but this time I lived on campus, with peacocks in the front yard and deer in the backyard, a Japanese garden, and 650 acres of trails available for exploration. A few new photos follow. My thanks to Professor Du for inviting me to her beautiful campus to work with a fascinating group of students! p.s. In November, Crossroads, the RRU internal publication, just posted a notice about one of the student projects in the course.